As the overall venture market environment evolves in 2016, so too does the SaaS and Software segment. The number of Series A, B, C, and D investments in software companies stabilized at roughly 170 per quarter from mid-2013 through mid-2015, before falling 17% in Q4 2015 to a two year low. 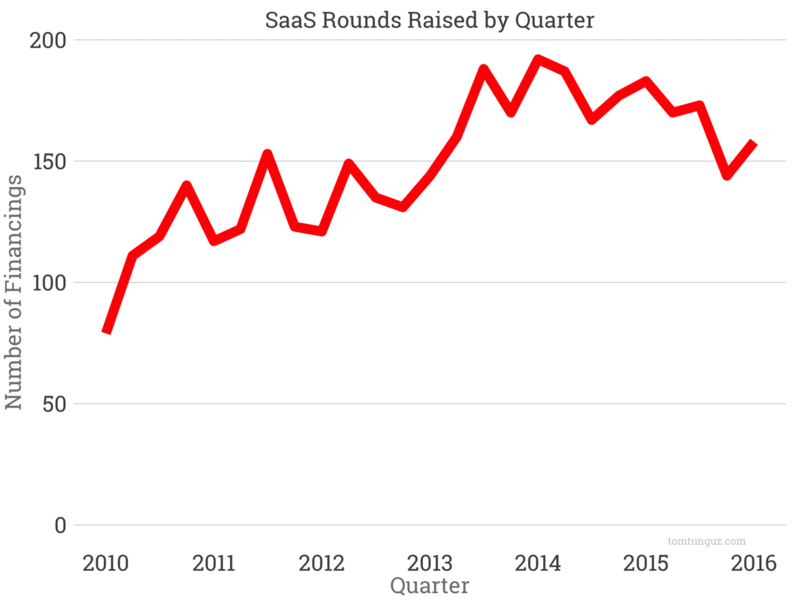 In Q1 2016, SaaS rounds increased a modest 10%. 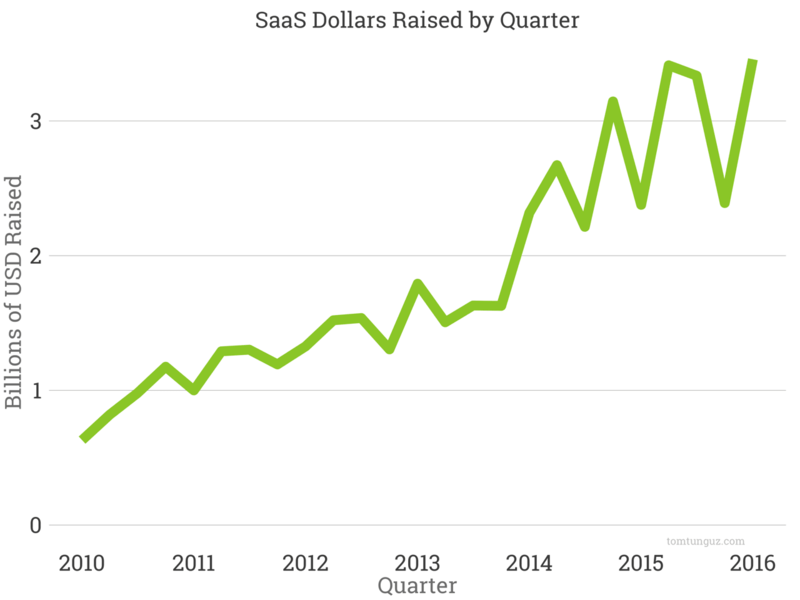 The SaaS fundraising has slowed in parallel to the rest of the market. But early 2016 pace still exceeds the best quarters of 2010-2012. In dollar terms, Q1 notched the greatest amount invested yet. The aggregate amount raised does seem to be stabilizing around $2.8B per quarter, and suffers from substantial volatility of about $1B. Many startups who raised their early rounds in the 2012-2014 time frame are growing quickly and raising substantially larger follow-ons. Let’s break down the data by series. Series A volumes have been declining steadily since their Q1 2014 highs. Over the past eight quarters, volumes have fallen by 25%. Series Bs and Series Cs are flat. Series Ds are down, but trivial in number. 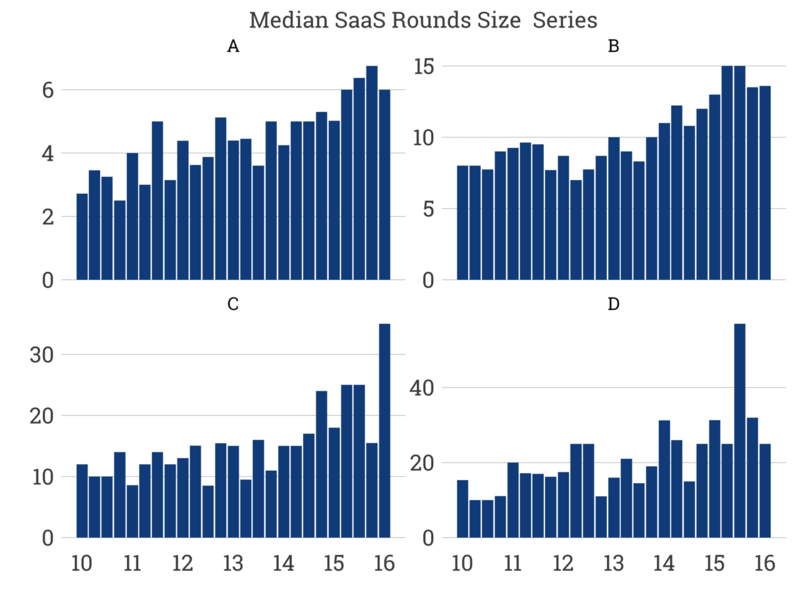 Though Series A rounds have slid, the median round size is at near five-year highs of $6M; similar for Series Bs at $13.6M. This behavior echoes the concentration of dollars we see in the seed market. Series C rounds spiked to greater than $30M after a quarter at $15M - the variance between the two figures challenges our ability to draw an inference. Median Series D round sizes though are stable. In aggregate dollar terms, Series As are flat; Series Bs have fallen by 50% from their highs; Series Cs spiked, reaching five year highs and Series Ds are stable. 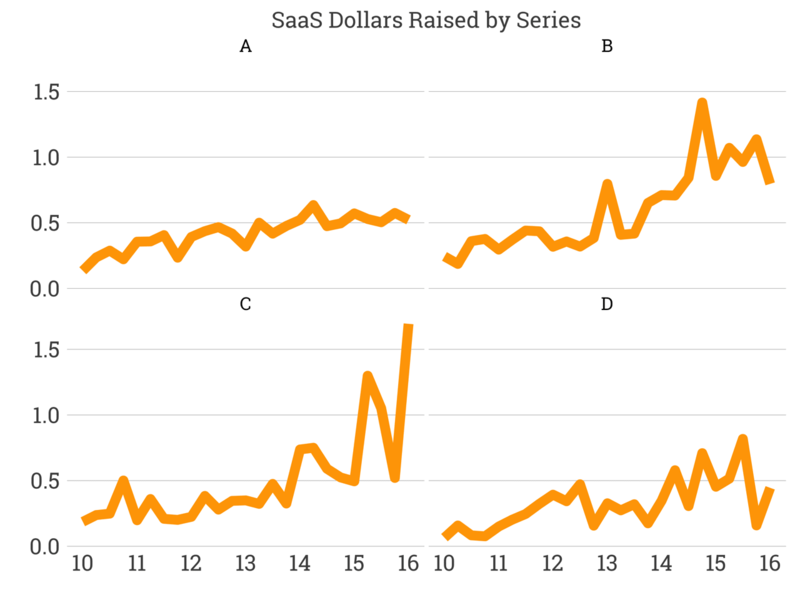 The SaaS fundraising market is remarkably similar to the overall venture market. Investors are concentrating dollars in fewer early-stage bets. 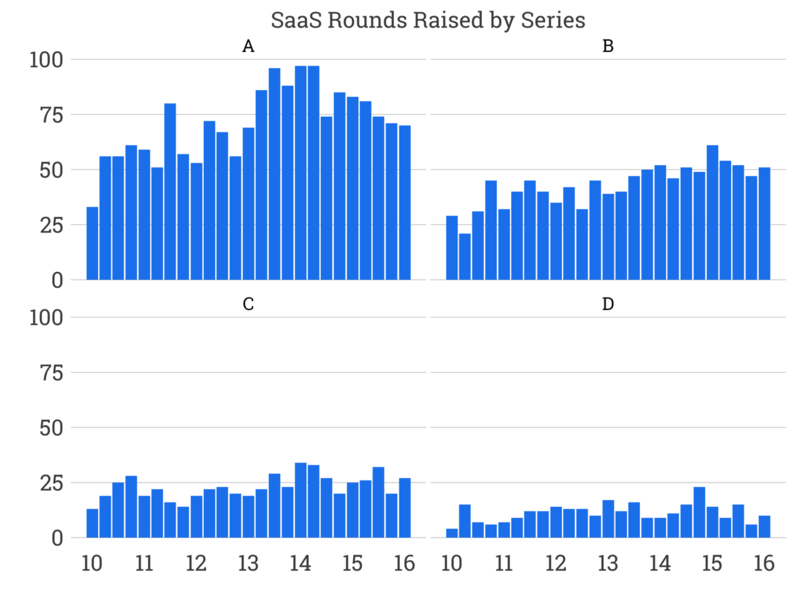 Series B rounds seem to be the hardest to raise as both the count and dollars steadily erode. There’s something funny going on in the series C market, because it’s the only one that is growing at any meaningful rate. Perhaps this is the return of the classic late stage venture investor, suddenly able to invest in businesses at reasonable valuations as hedge funds, mutual funds and family offices return to bread-and-butter investing and leave the venture market. In summary, SaaS startups today still enjoy one of the best fundraising markets of the last five years. The complexion of the market certainly has changed a bit, but set in historical context, it’s still a great time to be a SaaS founder.